The Manchester Jewish Community currently numbers about 35,000 - the second largest community in the United Kingdom, and dates from the 1780s. 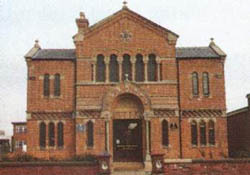 In the 1870s, North African Sephardi formed two communities in Manchester, one in Cheetham Hill and the other in West Didsbury; the former is now the Manchester Jewish Museum on Cheetham Hill Road. It has not only a varied and fascinating collection of photographs, documents and room settings which help visitors gain an impression of the people who arrived here during various periods of Jewish immigration, but also archives, costumes, textiles and works of art. The museum is open Mon-Thurs 10.30-4.00pm, Sunday 10.30am-5.00pm and is closed on Saturdays and Jewish Holidays.